This week’s item is the Elephant statue that stands in our meeting room. What does a carved wooden Elephant have to do with Pope County? Good question! The answer is – Nothing really, other than a very interesting man who once lived here brought it home as a souvenir. Back in the late 1950s a man named L.D. Kramer came to Glenwood as a pastor for the Assembly of God Church. He started a radio station and broadcast religious programs locally. Then in 1959 he bought a rest home and began a ministry to create Nursing Homes to care for the elderly and sick. In the early 1960s he expanded his ministry to include television programs, left the Assembly of God pulpit, established Assembly Homes, Inc. which opened several nursing homes, and created “Dial -A Meditation” where people could call in to hear a 2 minute meditation each day. By the late 1960s Reverend Kramer had 3,000 residents in 30 nursing homes in nine states, a “Challenge of Truth” radio and TV ministry shown on 10 television stations, as well as book and magazine publications. Glenwood, Minnesota was the headquarters for all these operations until 1970. In the 1970s Reverend Kramer carried crusades to different parts of the world, including India. In Madros, in the first crusade, he wanted something to capture the characteristics of the people. He bought this elephant to bring home as a souvenir. 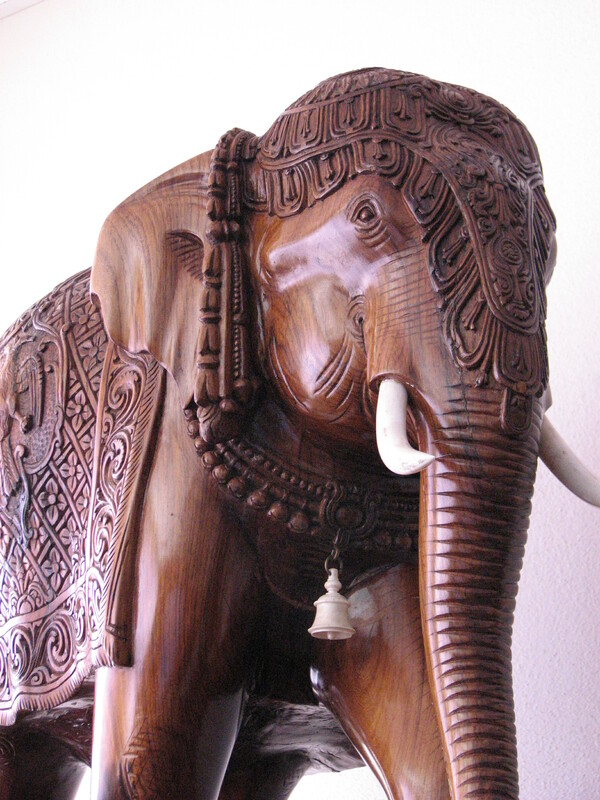 It elephant is made of one piece of wood and the tusks are actually ivory tusks. By the mid 1970s, he had moved his headquarters to Dallas, Texas and became the subject an Securities and Exchange Commission investigation. He was accused of fraud and misappropriation of funds. The case was settled with no admission of wrongdoing, but Kramer stepped down as director, the nursing homes were sold, and bondholders got their money back. About that time, he made a large donation of artifacts to the Pope County Museum including the elephant statue. In the 1980s, Kramer was involved in a Marshall based company called American Energy Farming Systems (AEFS), which attempted to develop the Jerusalem artichoke as a major source of alcohol to be blended with gasoline similar to ethanol. It was marketed as a salvation for rural America by providing cash for farmers while reducing our dependance on foreign oil. AEFS existed for only 18 months and handled over 25 million dollars from 2,500 farmers. Kramer was hired for his experience running a large company. When they filed for bankruptcy, the three partners (including Kramer) were charged with diversion of cooperate assets. Eventually, Kramer was convicted of theft by swindle. Many people in Pope County think of Reverend Kramer as a selfless, warm-hearted charismatic preacher whose dream was to serve God by caring for the aged. Others, especially farmers involved in the Jerusalem Artichoke experiment, have a less rosy opinion of him. Either way, the Reverend L.D. Kramer left his mark on Pope County. So – returning to the elephant… does it belong our collection when you consider that our goal is to collect and preserve POPE COUNTY history? L.D. Kramer has a fascinating story that needs to be recorded here at the historical society – and it has been. Does the elephant help tell the story? Would it make more sense for us to display an artifact with a stronger Pope County Connection in the meeting room? Or does the unusual nature of the artifact and the story of the man who donated it justify its place in the collection? This entry was posted in Collection Notes and tagged A-Z, elephant, Pope County History, Pope County Minnesota, Pope County Museum. Bookmark the permalink.